well as the realm of music that serves as a soundtrack to his images. is full of hidden gems, worked seamlessly into almost every piece. details begin to emerge and reveal themselves. the 70's with their soft merging edges and separated colour palettes. 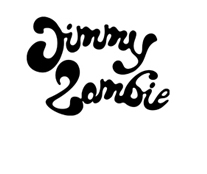 Take a trip and explore the weird and wonderful world of Jimmy Zombie.